Still trying to overcome his fear of flying after a plane crash that nearly killed him, Sgt. Eric Reid doesn’t have time for PTSD as the new Skyman! The superhero’s life isn’t made any easier by the confrontations with his handler and the shocking number of bugs plaguing his suit. And matters are made even worse as he discovers someone’s trying to sabotage the suit and smear his good name! Cover– A simply gorgeous and striking image on the stands, as a Arabian inspire architecture of Cairo burns below Skyman and his striking Blue and White costume, with civilian in hand soars to the sky. I love it! Art-Manuel Garcia’s art is better than last issue; it’s not as jagged or rough. Compared to DC and Marvel’s art it lacks certain smoothness but the inks and colors really do give it a unique look. Things to come– So after recruiting Reid to the Skyman program for “affirmative action” the program has then gone on doing assassinations. This is the type of “government conspiracy” that you can get quite a bit of mileage out of. Reid stealing the suit and going off on his own opens up even more possibilities. Black Hero– The new Skyman is here and if the cover is to be believed he’s the titular star. Also worth noting is Reid being the second character of color to use crutches and have a back injury. The other being Silhouette. Art- While I do like the art when I asked my wife at a casual glance she thought it looked unfinished. It lacks a certain smoothness which would greatly enhance the overall package. Cliché- yet another government conspiracy, have we not had enough of these already? 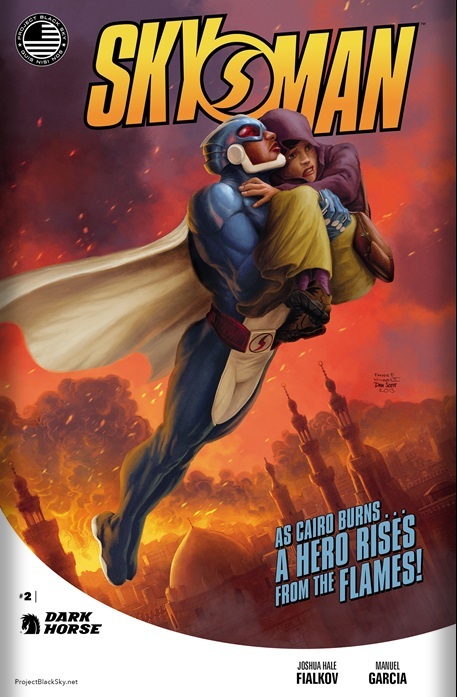 Skyman is well written and well illustrated providing a interesting story and protagonist. We give this issue a 3/5 Stars.